The property site's group profits and revenues are up despite the efforts of OnTheMarket. The past year could have been utterly disastrous for Zoopla. The property group’s core eponymous website has faced a stern challenge from the new estate agent-backed competitor OnTheMarket, which threatened to starve it of revenues. Although its new rival has drawn away 22% of Zoopla’s estate agent members, its full-year results, out today, look pretty buoyant. Group operating profits are up 23% to £48.7m on the back of a 34% jump in revenues to £107.6m. CEO and founder Alex Chesterman said the business had endured a ‘transformational year’, adding that, ‘we have made great progress towards our vision of becoming the consumer champion at the heart of the home.’ Presumably that’s not to be taken literally – I don’t expect to find Chesterman inhabiting my under stairs cupboard. 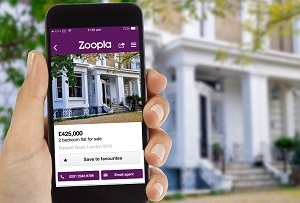 The figures are muddied a little by Zoopla’s acquisition of the comparison site uSwitch earlier this year. The takeover was seen as a bid to diversify in the face of OnTheMarket’s existential threat, and it seems to have paid off. All of the group's growth came from the £27.7m of revenues generated by its 'comparison services' division, against almost flat revenues from its property services side, which includes Prime Location and Smart New Homes. Read more: Time to show estate agents the door? Its UK member agencies may have dwindled but Zoopla is working them harder, increasing its ‘average revenue per account’ (ARPA) across every category of its membership. It also said its number of estate agent members has been rising since May, suggesting OnTheMarket’s rise hasn’t been terminal. ‘Traffic to our property platform remained strong with high levels of user engagement and we recently passed the significant milestone of over seven million downloads of our property apps,’ Chesterman added. Its revenues may have taken a slight knock from the rise of OnTheMarket but Zoopla seems to have dodged a bullet. Whether that's good for the property market at large is a point of dispute. Is streaming good for the music industry?